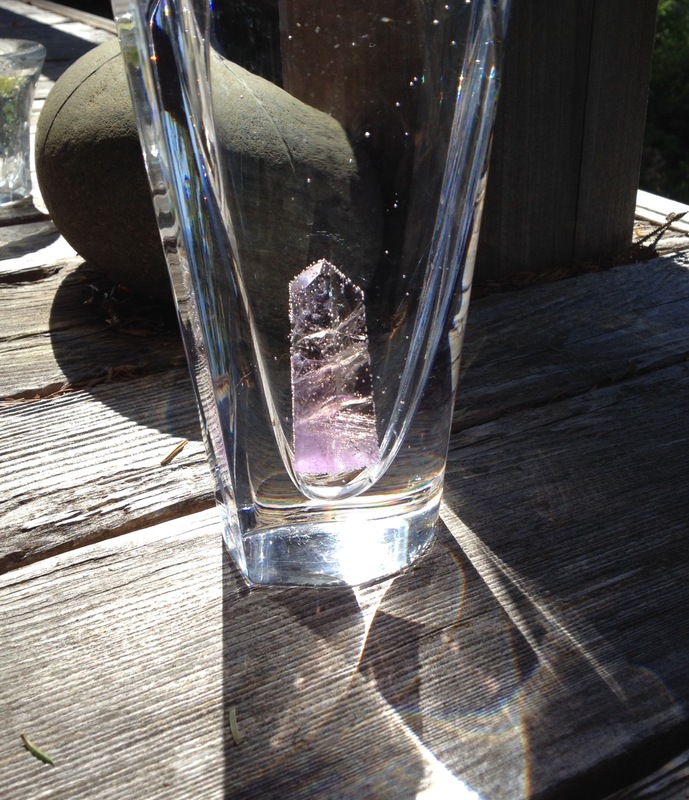 Infused with Love in a crystal vase usually in both sunlight and moonlight during a special celestial or earth event. Made in Neahkahnie Mountain spring water, they contain alcohol as a preservative. Because they are vibrational Spirit Medicine, they operate on a subtle level of one’s being, similar to homeopathic remedies. Always they come from a being – a plant, a place, a stone – that wanted to give its gift to us humans. I listen to the meaning & character of each gift as told to me by the being itself. I’ve also included comments from a local friend, Diana May, who is a channel and healer, on some of the essences. All essences are 9 each unless otherwise marked. No additional charge for shipping within the U.S.
Wakes the spirit into deep healing. 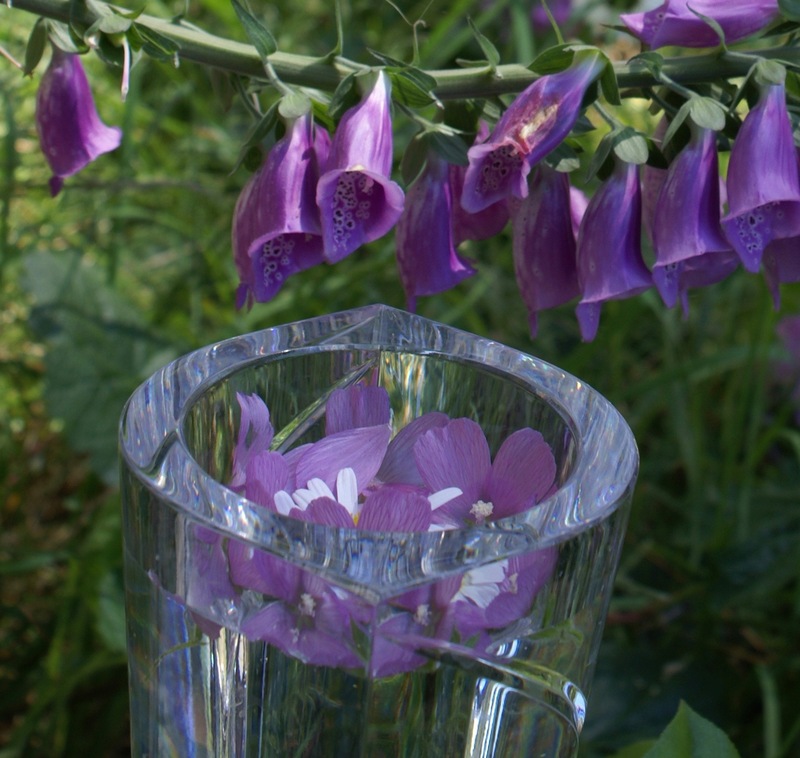 Also good for enhancing intuitive perceptions and is a potent connection to the Violet Flame. Mt. Shasta on Dawn Shears’ birthday. Rise to one’s Queenly energy. Dedicated to Astarte. Clearing the Heart for True Love (and not just the romantic kind). Diana May says this essence allows inspiration and creativity to come forward. Illuminates & eliminates dependencies, as well as old skins that need to be shed to field our true visions. Integrates the God and Goddess in all of us. Made at a community celebration of the turning point into the Age of Aquarius. A very special babe who was with us only 2½ years. Dedicated to Kali Ma. Moving into One’s Power. This most magical of native plants grows around our Table Rock portal & was picked to bless Craig and Glenna’s labyrinth during a ceremony for the Oceans and a fire afterwards for Full Moon Drumming and dancing. Diana May says it brings forth the JOY aspect because little Spirit beings were dancing around during it’s making. Lunar Beltane, May 4, 2010. Coming Together Without Fear – Re-Integrating lost parts of the Self and one’s tribe so that the symphony of the whole can be heard. Comfrey’s Latin name is Symphytum. In the Herbal Tarot, Comfrey is the World card – the final coming together card. A potent plant indeed. Repels “boarders” as in invaders of all sorts (energetic, viral, parasitic, etc.) This is about boundaries & perimeters. And Grandmother Coyote. Releasing old stuff from one’s parents especially sexual patterns. Remembering the Goddess, especially in Her light blue Virgin Mary form, one of the ways She stayed present to us during the Dark Ages we are only now coming out of. Notice subtle blessings. Quiet flower with a gentle fragrance. Early spring growth after the long winter. Overall Healing. This is a classic case of a “weed” that has great systemic healing properties. I suspect it helps with whatever ails you. MINER’S LETTUCE FLOWER (aka Candy Flower). Infusing Intention. A spark igniting creativity on the day Celtic tradition tells us the Goddess Brigid stirs the roots & seeds in the ground. Mahonia Nervosa from up Neahkahnie Mountain. Coming into true. Shining as one’s truest whole self. Seeing. Grounding the pineal gland (mind’s eye, 6th chakra’s inner core) into the 1st Chakra, the Root. 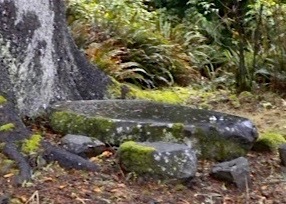 Made on the Table Rock Portal under the towering Sitka tree. Being with the Mystery, especially our emotional blind spots. This plant spread on our land, despite my attempts to dig it up. I finally accepted it as part of the journey. Going deep to find the ancestors as guides. Dedicated to Inanna for it was made in her garden. Bright yellow Summer Sun Energy, especially when needed in the dark of winter. .St John’s Wort is sacred to the Summer Solstice and is commonly used for depression. Diana May got it that this essence has deep transformational qualities. She says it is very subtle and best taken over a 3 month period. Set an intention and over time a very quiet kind of awakening will happen. Stimulates innate healing reserves. I first “met” this innocuous little purple flowered plant on my 50th birthday in 1999 and then began to see it in people’s yards everywhere. It has powerful medicine whenever you pay attention to it. Prunella vulgaris. 12/12/2012 – Inspiration and manifesting. Created on a magical day in a labyrinth on Neakhahnie Beach. 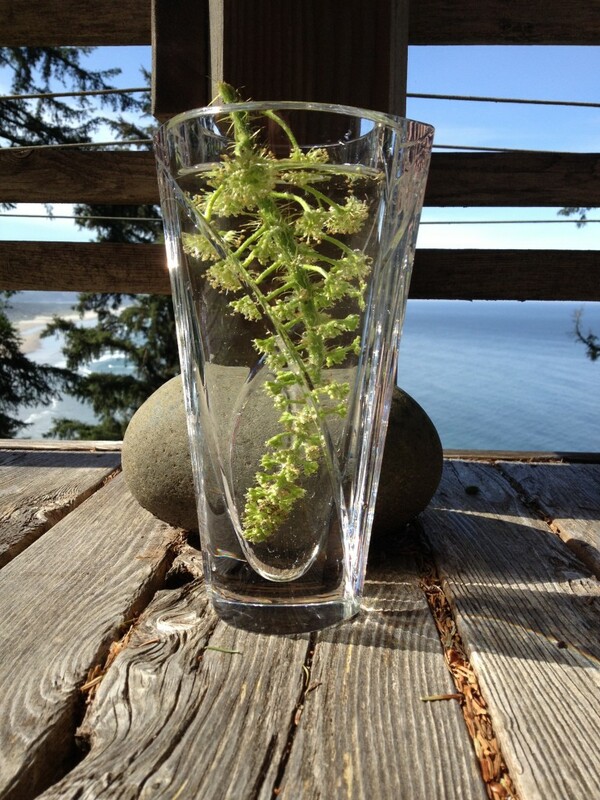 Calming Fears -The plant came to my garden from Roberta Mackrill’s garden in Corbett, Or. She said a lot of it was growing because we were going to be needing it. It will get at some deep deep fears you’ve carried a long time.Diana May says you will want to sing from your heart with this one because it aids the purity of the soul coming through to the heart. Enchancing the Violet Flame, connecting with Kwan Yin, Goddess of Compassion. Repairs aura from empathetic sensitivity, radiation and trauma. Connect with the matriarchical grandmothers. Made on the anniversary of my Grandmother Marie’s death day. Checkermallow, Foxglove, Fawn Lily Seedpod. The creative energy clicked into place and obstacles seemed swept aside at a blessing circle for Coyote Ridge in Nehalem. Made at Wanderland Rainforest during Gwendolyn Endicott’s Journey to the Hindu Goddess Durga. She conquered demons of greed, jealousy, hate, etc. besetting the ancient world through love and promised to return when truly needed. Durga, it is time. Deepening Connection to Gaia – Green Goddess of the Earth. A burst of summer growth energy made during a wild weekend of earth revelry and Neahkahnie Mountain connections. Creates subtle third eye and throat chakra openings without psychoactive side effects. I was on the lookout for an essence that would move stuck energy, but it had been a long, chilly, rainy spring. So I picked the only blossoms managing to bloom in the gloom. They told me the name of the essence wasn’t “move forward” but “spring forward.” Of course! Diana May recently sang about it: “Go to the wounds, go to the wounds, go to the wounds.” It will take you to the wounds and open them.